Stefan Duerst is a creator whose mind, body, spirit and sculptural works can all be viewed through the concept of Liquid Steel. There is fluidity and strength aplenty. Stefan’s metal works are suitable for indoor or outdoor display. Some are free standing; some hang on a wall. Some of his works are so large that they will not fit in our gallery. This has given us the opportunity to do something we have long wanted to do – exhibit artwork in Market Square. 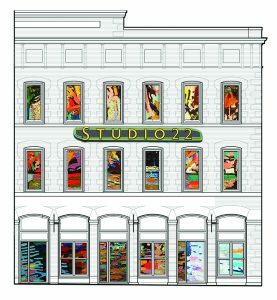 For the evening of Saturday July 19th, we will be exhibiting Stefan’s larger works in historic Market Square concurrent to opening his ‘indoor’ exhibit at Studio22 (overlooking the square) between 8 and 10:30 pm. The outdoor exhibit is open to the public. Since moving to Canada over 18 years ago, I have been collecting tools and equipment that fill my 1800 sq ft studio, enabling me to produce high quality work in a variety of sizes for the 60 acres sculpture garden on my property near Godfrey, ON. I am drawn to the inherent qualities of steel; the paradox of its structural integrity and nearly unlimited malleability. Heating this metal in my forges allows me to shape it by handheld hammer, anvil, power hammer and bending fork. I fabricate the pieces without the help of an apprentice, which often pushes me to my physical limits and thus creates a deep, meditative connection with my work. Important to my work is the Canadian shield; the natural environment surrounding my house and studio provide an endless source of inspiration to me. I bring to these scenes of nature a sensibility inspired by my European background, especially the Bauhaus period and the metal sculpture movement in the 60’s, as well as Art Nouveau. These influences are evidenced by the combination of a strict geometry in dialogue with flowing, organic lines. Also integral to these works is the play between space/non-space, minimalism, archaic forms, and the properties of the material itself. The surface treatment of my work ranges from raw steel to bright industrial paint, depending on the overall emotion of the piece.